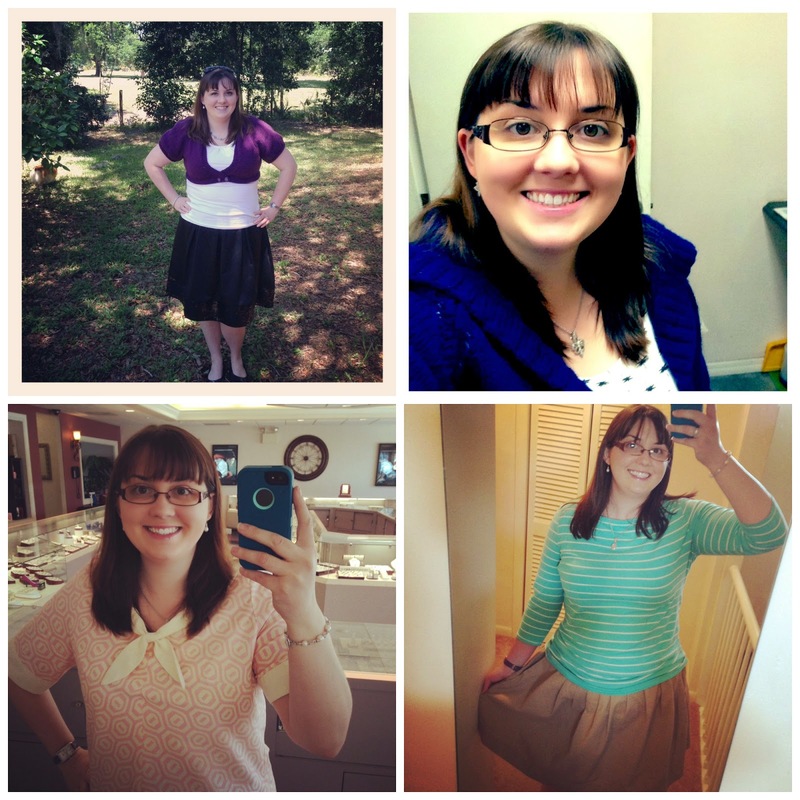 Top Right: My "First" Sweater (this was my first day back at work after being sick, not the best pic, lol). Those are all the pics I took :( I did wear my black sequin skirt and khaki skirt a few more times, and my blue sweater is always in my bag for when I get cold at work, but I didn't take any more pics of them. I've actually never worn the Jasmine muslin before other than just trying it on after I finished it - and I have officially diagnosed why I don't like it: It looks straight up like a 1950s maternity shirt. Don't let the clever camera angles in that photo fool you. The fact that it's too big (even with altering as much as I could) means that the center seam sticks away from my body (because it's cut on the bias). Normally, this creates a flattering silhouette ... unless it's too big. It looks like I'm hiding a belly. Add the pale pink color and the retro collar and sleeves and it's like a stereotype bad preggo shirt. I do still love the pattern itself and I have one almost finished in nautical colors that is actually my size and it looks much better, so this was all just a learning experience. Needless to say, I don't think I'll be unearthing this again unless I am actually pregnant, lol. I had hoped to wear all of the items I had made for myself, including my shawls and other knitted items. Frankly, it was just too freakin' hot to even consider putting actual wool on my body out of doors. So I gave myself a pass on that idea. I also had set a few loose goals for myself: 1) to finish and wear my Butterick 5982 dress and 2) to finish and wear my Miette Cardigan. Unfortunately, I failed at these as well, lol. I did finish all the knitting on my Miette, but I was hung up on buttons. I searched my stash and didn't see any I liked, so I had to wait until I could make a trip to Joann's. The dress, I'm ashamed to say, has sat in the same position it did when I put it down the night I got sick. I was very gung-ho about it before hand, but after being down for the count for a week I was so behind on housework that I couldn't justify the sewing time, and by the time I did a few chores each night I just wanted to sit on the couch and knit. Add to all this the fact that I didn't have a day off from work over the last 3 weeks, and you end up with unfinished projects. I do still hope to finish the dress soon, and I did a little more thorough stash digging this weekend and found some buttons that were exactly what I was looking for :) Funny how that works. So, I hope to block it and finish things up on my day off this week. I had other plans for alterations - in fact I have a Jessica London black skirt that I thrifted sitting on my table already marked, pinned, and ready to sew - but I couldn't be bothered to change the thread in my machine, lol. I actually really want that skirt now (it fills a huge hole in my wardrobe), so I can see that being finished relatively soon. The best laid plans, you know. I'm noting if not good at planning things to make. Even though it feels like a bust, I really enjoyed Me Made May this year. I liked that I actually got to participate a bit. I put my pics on Instagram and then I would look through others outfits. I found a few more blogs to add to my blog roll. I am taking this experience and plan to grow on it next year.